Red Bazar formed in 2007 as an instrumental trio featuring Andy Wilson on guitar, Paul Comerie on drums and Mick Wilson on bass and keyboards. The line-up released two albums, ‘Connections’ and ‘Differential Being’, and a three track EP, ‘Beyond The Ice Storm’. The releases were well received by audiences and critics alike and the band developed a reputation for their live performances. To expand on the sound, the band recruited keyboard player Gary Marsh and soon after teamed up with singer and multi instrumentalist Peter Jones. Progressive Aspect reported ‘Red Bazar may just have released one of the Prog albums of the year’. 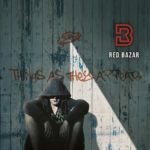 Red Bazar is undertaking a series of live performances in 2019 to promote their new album ‘Things As They Appear’ which will be released on 26th January 2019. The live line-up features Andy Wilson guitars, Paul Comerie drums, Peter Jones vocals and keyboards and Mick Wilson bass and vocals.